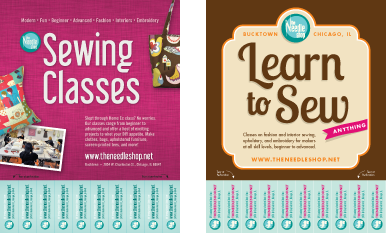 The Needle Shop, a lovely DIY sewing school and fabric store in Chicago, hired me to design a flyer they could post to advertise their sewing classes. Something budget-friendly and simple, but a step up from the raggedy "free puppies" notices tacked up at the grocery store. You know the type: people tear off phone numbers from the bottom and after a few have been taken, the notices start to look like they've been gnawed by rats. We can do better! Let's perforate those tear-off strips. The pink design was selected and printed at Uprinting.com. 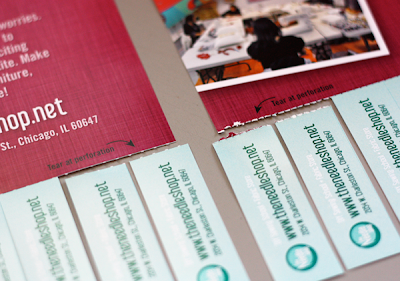 Then, since The Needle Shop loves DIY projects, I proposed a couple easy ways to perforate the flyers—saving them the money a printer would charge to finish these. One option is to sew a line of stitches with an unthreaded sewing machine. The needle makes punctures in the paper that help it separate more easily. Another option is a rotary perforating blade. These are similar to the standard blades in rotary cutters, but the edges are notched. They make a series of dashes in the paper. I hunted around online to find a 45 mm perforating blade that fits rotary cutters used for trimming fabric. I have a Fiskars cutter and an Olfa cutter. I couldn't find anything made by either of those manufacturers, but the We R Memory Keepers blade (a mere $2.18!) works with standard 45 mm cutters. 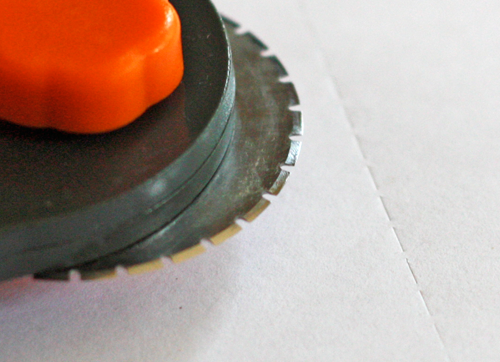 To use it, just place a ruler along the line you want to perforate and roll the blade along it. Works like a charm. Here's the perforating blade compared to the sewing machine. (Click the photo to view larger.) The blade gives a much easier, cleaner tear, but the sewing machine is definitely better than nothing. You could make your own coupons, tickets, invitations, and more. I'm fighting the urge to perforate everything in my house. Oh my gosh, so cool! What a great idea. Now I want to make something I can perforate! wow, that is totally cool! Sweeeet Candy!! I love it! I need one of those NOW! Awesome tool for a totally cool price! Wish I needed to perforate something! I used these to make raffle tickets for a dinner benefit. Just printed the prize and and number on one end and a corresponding number on the other. They were fun to sell! I swear you have the coolest ideas! I just love your blog, plus orange is my favorite color too. This is fabulous, thank you! I love love love the needle shop! I visited a week or so ago and saw your fabric (which is fabulous btw). They have the best stuff! When I want to perforate I use a pattern tracing wheel I got for 7th grade home ec. Works great for me. That's awesome! What a great idea. What a great too! I'm not sure what I'd use it for but I want one now LOL! It looks super handy. Love that gizmo --on my list!!! I've also used my sewing...Darn, I can't remember what the doodad is called. But its the spiked-wheel that is used in marking darts or whatever then sewing. You put a piece of transfer paper between the pattern and the fabric and run the "doodad" along the lines so that the marks can be seen on the fabric. For all you sewers, you'll know exactly what I mean! For you non-sewers I hope you understand! Wow, the Spiked Wheel Doodad sounds intriguing. 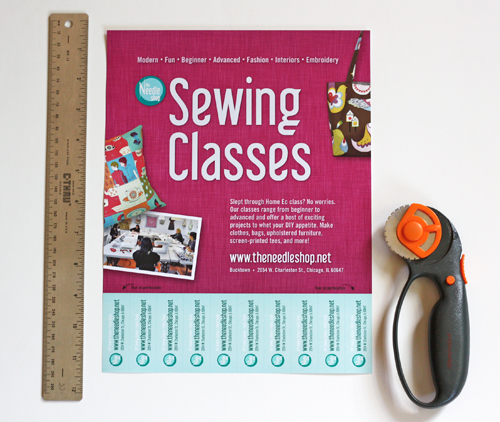 I've never used this item since I only sew straight lines and haven't graduated to patterns!